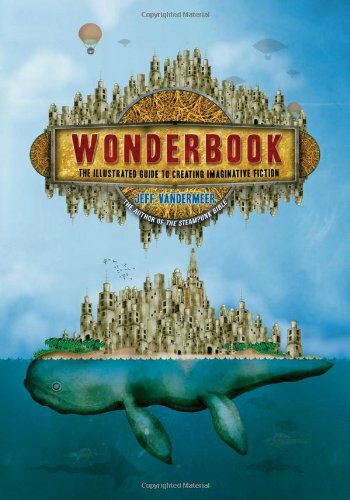 Just this morning, I finished "Wonderbook" by Jeff Vandermeer. I'm not going to do a Magrs Method review here because this book, as fantastic as the cover presents it to be, is a how-to book. In fact, the subtitle is "The Illustrated Guide to Creating Imaginative Fiction." This book lives up to its cover in every way. It is fantastic, especially if you are a fledgling or even intermediate writer that is looking for guidance about how to improve your craft or seeking some inspiration from the minds of other highly creative (and successful) authors. The author, despite what you may think on first glance, offers a very consistent and easy to follow guide to creating fiction. Starting with things as simple as "make sure your space inspires your creativity," he progresses to describe the different parts of the story and subsequently show how to think and act on every part. You can't really talk about the prose in this book without calling out the illustrations. If you think the cover is good, you ain't seen nothin' yet. Jeremy Zerfoss is the principle illustrator, and the book is full of his sublime work. Literally, this is the most beautiful book I've read in quite some time. The book also features other illustrations of the wondrous and strange. Every picture struck a chord with me, and I actually spent time studying each one. Beyond the guide, the book also has writing exercises along the way that help drive home the points that are being made when the exercise is introduced. The appendix of the book is full of ANOTHER set of exercises as well. If the first rule of writing is "WRITE!" then this book encourages you to obey the rules. I did most of the exercises and was pleasantly surprised by at least a few of them. I have always thought I have at least one good story in me. It's quite possible I've got more than one, given the way my brain seems to work. For the time being, however, I still consider myself a non-writer. As such, this book was slightly overwhelming, but thankfully made me aware of two very important things. 1) Writing is a job you do because you love it. It's ridiculously hard, has aspects that are tedious, presents situations you simply have to fight through, and possesses every other facet of a day job that frustrates everyone else. 2) The writing community is full of people that are genuinely happy to help other people realize a dream of becoming a published author. The publishing community, not so much. Alright, that might be harsh. The fact of the matter is that there is a LOT of content in the wild that most people wouldn't enjoy consuming, and agents, editors, and publishers serve as wilderness guides in a very real sense. Oh, one other thing about the book. It includes contributions from a bunch of different authors, including (but not limited to) Neil Gaimon, Lev Grossman, Ursula K. Le Guin, and George R. R. Martin. I found these contributions really insightful, and they offered perspectives of people that have been in the business of writing for the better part of their lives. If you want a peek inside the operating procedures of some of the best and most popular authors in recent history, this book provides the keyhole. I really can't say enough about this book or recommend it highly enough. I will certainly read large parts of it again as I work through the exercises in the appendix. If you've ever had a hankering for writing or were curious to see what the process looks like, pick up a copy of this book. If you always suspected that writers were only semi-normal people, pick up this book to validate that suspicion. If you enjoy a good how-to book with lots of pretty pictures, pick up this book. If you have a birthday coming up and $25 is the gift purchase limit, you should add this book to your wish list.